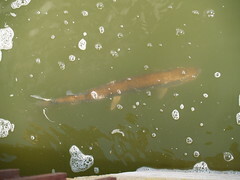 Muskie at Wingra Dam. Each spring, muskies swim up Wingra Creek from Lake Monona and attempt to jump the dam into Lake Wingra. Taken 2009-04-03. Thanks! It came out better than I hoped. Nice shot and thanks for the learning opporunity. I never knew that. I didn't know about it until a couple of years ago when there was a brief line about it in the State Journal. I guess the best times are the last couple of weeks in March when it starts to get a bit warmer.